With Thanksgiving right around the corner (I know, right?! ), I thought it would be appropriate to share one of my favorite holiday dishes with y’all. In the south, collard greens are a timeless, good for your soul, classic. I always keep a bag of already cleaned and chopped greens (collard, kale or turnip exc.) in my freezer for quick additions to soups and stews and even smoothies but I usually only make this dish once a year. The fibrous and slightly bitter leaves require an extensive cooking time but it is well worth the wait, trust me! Being in season during the fall/ winter months, beautifully hued deep green collard greens are available for cents by the pound. I never realized how romantic collard greens could be. We’re a Texas Pete house hold, but lately, J-Wiz has been diggin’ Franks Red Hot. We’ll use Texas Pete. Words of wisdom: You don’t get in between a southern girl and her Texas Pete! This is a smoked turkey leg. Hands down, best invention since sliced bread. Place the turkey leg, onions, garlic and water/ stock into a fairly deep pot. A stock pot will work nicely. On high heat, bring to a rolling boil. Then bring it down to medium-low heat and simmer for about an hour. While this is cooking you’ll need to prep your collards. You’re going to want to clean these beautiful bunches thoroughly. They will be sandy and gritty with dirt. Soak them in a sink full of salted warm water. A little apple cider vinegar in the water will help clean them as well, as with most produce. Gently rub each leaf clean, letting the grit settle to the bottom and then down the drain. When you’re finished with that, starting at the base of the stalk, pull the leaf away from you, removing the stalk. These are too fibrous to eat so set them aside to compost later. Next, stack the leaves about a dozen at a time and roll from one side to the other. Then slice into one inch pieces, resulting in strips. Repeat until all of the leaves are cut and set aside. After about an hour, the contents of your pot should look something like this. 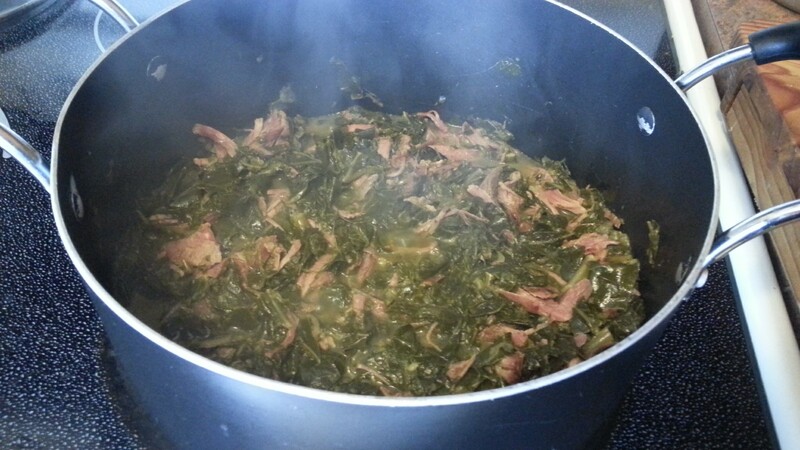 Dump the cut collard greens into the pot. Your pot won’t seem big enough. Don’t let this scare you. They will wilt quickly. After another hour of simmering remove the turkey leg. The meat should be falling off of the bone by now. 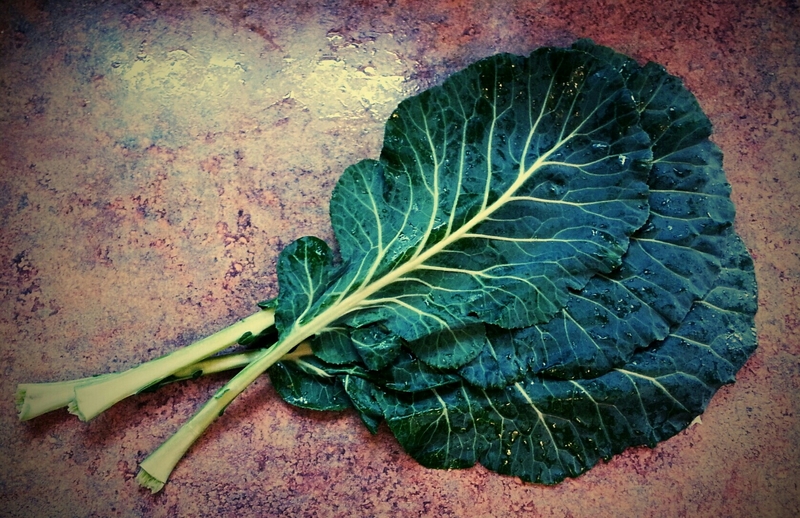 Carefully search the collard greens for any bones that may have splintered off. The last thing you need is Gramma being rushed to the ER, on Thanksgiving Day, with a turkey bone stuck in her throat! 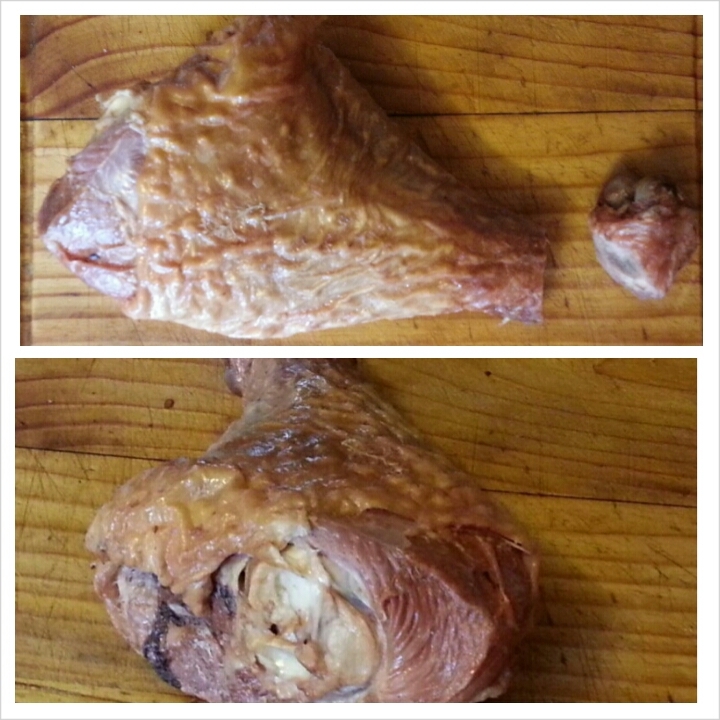 After the leg has cooled to the touch, pull off all the meat and discard the skin. Add the smoked turkey meat back into the pot. Looks delicious huh? I can hear your stomach grumbling. I know mine is! But hold on, calm down, you’re not done. Some smoked turkey legs are saltier than others. Taste it. Add a little seasoned salt if you think it needs it. Everybody like their greens different, so just keep the bottle handy for others along side the apple cider vinegar and Texas Pete. Yep. All hot sauce will be generalized as Texas Pete by me. None other exists. Now dig in. 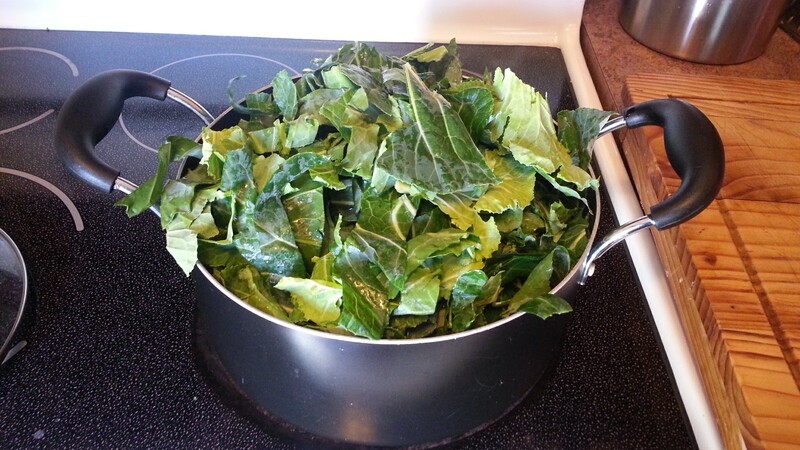 ***After and hour of cooking, collard greens are ready to eat. But the longer you let them simmer, the better they will get. It’s nearly impossible to over cook them. When the water starts to evaporate, add a little more. I’ve had greens on the stove simmering on ultra low ALL DAY. A crock pot works great also! ***That gorgeous flavor-filled liquid, left in the pot after all the greens have gone to turkey day heaven, is what we call “pot liquor”. Don’t you dare throw it away! It’s packed with nutrition and flavor. Store it in the freezer for your next batch of greens or add to soups and stews. ***Vegetarians like collard greens too! 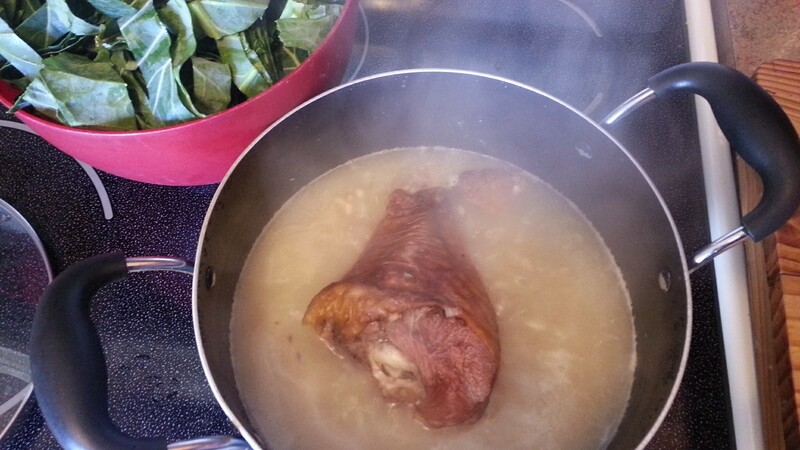 Omit the smoked turkey leg and substitute the water/ chicken stock for vegetable stock! You’re Welcome. Enjoy and Happy Turkey Day!! This entry was posted in Crock Pot, Dinner, Food, Holiday cooking, Low Carb, Recipes, Sides and tagged Collard Greens, Holidays, Smoked Turkey Leg, Soul Food, Southern, Thanksgiving. Bookmark the permalink. And that my friends is why i cant wait to go home. Reblogged this on ashley à la heart.